Unlock SD Connect C4. Change the serial number. Update firmware. 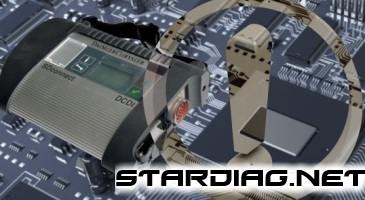 Home » Services Star Diagnosis C3, C4 » Unlock SD Connect C4. Change the serial number. Update firmware. Diagnostic scanner Mercedes Star diagnosis C4 (SD connect) has a number of features that you should keep in mind. Serial number of SD Connect multiplexer Chinese production or original, which not registered in the official order, quickly tracked and entered in the blacklist (black list) software Xentry/DAS that in the case of using such a device causes it to block at the hardware level. At the moment all the factory serial number of the SDConnect multiplexers Chinese production is already in the blacklist. Thus, without changing serial numbers, it is safe to operate such devices is only possible with the version of the software which it was supplied by the manufacturer. In other words, the multiplexer is considered to be not updatable. Firmware version multiplexer corresponds to a specific version of Xentry and DAS programs. When working with software Xentry/DAS version which is different of the firmware version of your device, the system can inform about the need to update the firmware of the multiplexer to the version corresponding to the version of the software, or will automatically start the firmware update process if the multiplexer is installed batteries. Or display a message about not able to initialize the multiplexer. In the process of updating the serial number of the multiplexer checks the s/n “blacklist” that in case of a match, shall result in blocking of the device at the hardware level. The block multiplexer can occur when you first start programs Xentry or DAS with connected multiplexer, and in the process of working with the car. Lock the device shows an exclamation mark on the display. Recovery (release) multiplexer SD Connect C4 possible only through replacement or reprogramming of the PIC16lf88 microcontroller. The procedure requires a dump of the microcontroller, the appropriate equipment and skills to solder SMD components and operate the programmer. Until recently was considered that one of the options to prevent blocking of SD Connect, there is an exception to update the firmware of the device by renaming or removal folders containing the update files ( C:\Program Files\SDconnect Toolkit: update_automatic, update_manual, update_special), after which the system no longer has access to the update file. However, practice shows that and after this procedure, the blocking device can still happen. In addition, such a solution can only be applied if the firmware version of the device corresponds to the version used. Otherwise, without firmware updates multiplexer, to the correct version, it is possible that the system not able to initialize the device, or its function may be limited. Another way to avoid blocking of the multiplexer is edit blacklist. Not the reliability of this method lies in the fact that these serial numbers are stored in several places system. Find fixed files for a particular version of DAS/Xentry which is guaranteed not to contain the number of your device, and paste replace in all directories is not always possible. Thus, the only solution is to change the serial number of the multiplexer to a unique number.